19 July 2015, Cincinnati, Ohio. Ray Tensing, a 25-year-old University of Cincinnati (UC) campus police officer is patrolling off campus when he spots a car with no front license plate. He pulls the driver, 43-year-old Samuel DuBose, over in a ‘routine’ traffic stop. Tensing asks DuBose for his driver’s license, and DuBose responds that he does have a license, but that he does not have it with him. Tensing opens the driver’s-side door, DuBose pulls it shut again and puts the car in gear, although he does not accelerate and the car is not moving. Tensing reaches into the car with his left hand, and with his right hand pulls out his pistol and shoots DuBose in the head. Tensing claims that the car was moving and that he was being dragged along after hooking his arm through the steering wheel and that was the reason he fired the shot. Footage from his body cam showed otherwise. In case you’re wondering, Officer Tensing is white, Samuel DuBose was black. Ten days after the shooting, Tensing was indicted by Hamilton County prosecutor Joe Deters on charges of murder and voluntary manslaughter. As a result, Tensing was fired by the UC Police Department. Tensing pleaded not guilty and was released on $1 million bond. The first trial began on 31 October 2016, and ended in a mistrial less than two weeks later when the jury deadlocked. The re-trial began on 25 May 2017 and ended in a mistrial on 23 June 2017. Less than a month later, Deters announced he was dropping the case. Now, I hear you wondering why I am bringing this sad story to you today, nearly a year after the case was dropped. Well, because that wasn’t the end of the story. Yesterday afternoon, University of Cincinnati officials announced that they have paid Ray Tensing a settlement of $344,230 for back pay, benefits and legal fees. Although UC fired Tensing on 29 July 2015, apparently the police union contract states that employees charged with a felony are to be placed on paid leave until the court case is resolved. Tensing brought a contractual grievance to the university regarding his termination. In exchange for the settlement, Tensing agreed to resign his position as a university law enforcement officer and to never return to employment at UC. A young white officer with only four years’ experience shoots an unarmed black man in the head, lies about the circumstances, gets off scot-free, and then sues his employer for over a quarter-million dollars … and gets it. And Samuel DuBose is still dead. This entry was tagged #BlackLivesMatter, Cincinnati Ohio, Joe Deters, Ray Tensing, Samuel DuBose, shooting of unarmed black man, University of Cincinnati. Bookmark the permalink. That is ludicrous. I don’t supposed any thought for one moment that the driver was scared by the sight of an armed white police officer. I imagine the really professional and responsible officers try to approach in a non-threatening manner when it’s an everyday enquiry, after all this could be the officer’s life on the line if they panic someone into running them over. Yes it IS ludicrous! You would think they would teach them to approach in a non-threatening manner for their own safety, but … I think they do that only when the driver is white. I have black friends who will go 20 miles out of their way to avoid driving through downtown. And guess what? It’s getting worse instead of better. Surprise, huh? Plus, this ‘campus cop’ wasn’t even on campus at the time, but was patrolling off-campus. My understanding is that there was an agreement between UC and the City of Cincinnati at the time, but that is has since been canceled. I have heard some African American males drive with a child’s fluffy toy in the back of the car, so the assumption is they have children and aren’t so much of a ‘threat’, though that doesn’t always work does it?. We’ve had incidents in the UK, but not to this extent. Check out Sw08 blog site as a memorial to injustices of this nature. I did … very nice tribute. I wish there would come a day there is no need for such, but … never going to happen, is it? Regrettably Humanity is plagued by this. Just check any nation’s history and you’ll find these dirty little smears along social, racial or religious lines. Behind any nation’s romantic legend of derring-do and a ‘noble’ fight for freedom, there are bits which have been airbrushed out. By all means be proud of your culture, your art, your achievements. but spare me the noble and just struggle….no such creature in the history of nations. Every nation has its collection of ‘Wounded Knee’ incidents Jill. It’s just that some ‘patriots’ and ‘romantics’ are uncomfortable with facts. Yep, and we small, insistent folk sometimes manage to be a royal thorn in the side of the ‘big guys’, and throw a wrench into their well-laid plans, like those kids did on Saturday! You’ve noticed that these types of cases don’t garner the coverage it use to, post President Trump. The idea that a kid gets shot at for not showing his license is outrageous. What happened to the idea of a school officer giving the kid a ticket with instructions to bring proof of a license to court or whatever office is appropriate. There has to be a way to bring these offending would be cops to justice because they are getting away with murder. Oh yes, I have noticed that this one went almost unmentioned outside of the immediate area. My opinion? Campus cops do not need to be armed, and their jurisdiction should be limited to the campus. Officer Tensing was patrolling off-campus when he pulled DuBose over! A missing front license plate … I have to wonder if Tensing would have even pulled him over if his skin had been white. Sigh. Hugs! This is horrible, Jill! Our campus cops don’t carry guns. Do campus cops wear guns in every state? My understanding is that not all, but some campuses allow their officers to carry guns. I’d be willing to bet the number of ones that do has risen in the past year or two. Further, in some cases, such as UC, the campus cops can operate off campus, as Tensing was doing. It was an agreement between UC and the City of Cincinnati that allowed it. Ridiculous, isn’t it? Good grief – that happened in your backyard? Yep … about 15-20 miles right down I-75 from me. Nice, huh? No, not nice. If I was a student there, I’d be paranoid every time I saw a campus cop – and VERY well behaved! I think that may be the case on a lot of college campuses these days! I even find that I am nervous when I see a cop in a grocery store, or other public venue. For a time, our Barnes & Noble book store had an armed guard walking around, and rather tham making me feel safe, it unnerved me. Hugs, my friend. The insanity starts with a campus policeman carrying a gun! Quite so. And … he was patrolling off-campus, which was, at that time, acceptable! 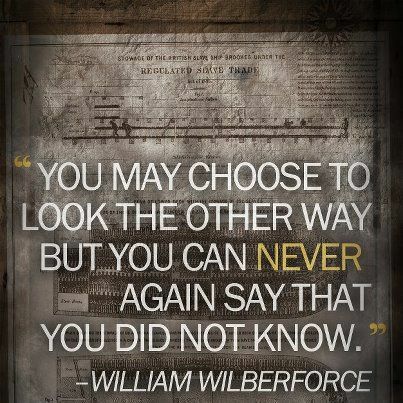 I have always loved that quote by Wilberforce. I have a great deal of respect for what he did to end the slave trade. Believe it or not, this was the first time I had heard that quote, and I stumbled on it quite by accident. I wish more thought like him today! Have you seen the movie about him, Amazing Grace? No, I haven’t … didn’t even know there was one! But after reading your comment, I checked it out on IMDB, watched the trailer, and it looks really good, so I added it to my watch list! Thanks! Samuel DuBose is the man who finds a cure for cancer if he’s allowed to live.Two of the jurors who would vote innocent for Tensing have cancer and are saved as is a grandchild of another. Instead Tensing is allowed to walk away after taking a life and then is the cause of 3 more lives being lost.I wonder how a jury would react knowing that. Killers can kill again. Excellent point, and one I hadn’t thought of. Who knows what one life may contribute to the world? dear lord, it just never ends!